Der (farblos/deckende) Extender # 579 kann auch mit den PearlEx-Pigmentpulvern für eigene! Metallicfarben gemischt werden. Farben mischen / Mixing Colors: Jacquard Neopaque comes in 13 and you can easily mix them to make any color you desire. Creating Pastels: You can mix #589 Neopaque White into any other Neopaque color to create pastels. Try mixing in a little at first and then adding more if you want to increase the effect. Increasing Transparency: You can increase the transparency of any color by adding #579 Flowable Extender to it. The more you add the more transparent the color will be. Increasing Transparency & Flowability: You can increase both transparency and flowability by adding up to 25% water. This will give you more of a watercolor effect. They also mix beautifully with Lumiere, Textile Colors, and Dye-Na-Flow. Neopaque Colorless Extender is an excellent medium for Pearl Ex Powders. Adding Pearl Ex to the other Neopaque colors will result in a muted metallic effect due to the opaque nature of the paints. 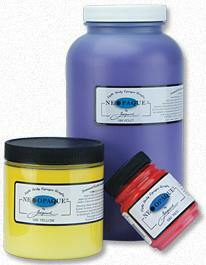 Application: Jacquard Neopaque can be applied with brushes, stamp pads, squirt bottles, screenprint and airbrush. For airbrushing thin with water up to 25%. Ironing: This is the best method. Use a dry iron and iron on the reverse side on the appropriate setting for the fabric. Dryer: Have the dryer on as hot a temperature as the fabric will take for about 35 to 45 minutes. Cleanup: Promptly clean all tools with warm water.